WELLINGTON: Virat Kohli bowed out of the New Zealand tour with India in an unbeatable position after a dominant seven-wicket win in the third one-day international in Mount Maunganui yesterday. It put India 3-0 up and world player of the year Kohli said with the series wrapped up early it was time for him to step aside for the remaining two matches and the following Twenty20 series. “I couldn’t have asked for a better performance after the first two clinical performances and just the relentlessness of the side is something that really pleases me,” he said after India easily chased down New Zealand’s 243 with seven overs to spare. “I haven’t had a break for a long time. It’s been a very hectic Australian tour and now I go on a break very happy, 3-0 up, sealing the series and I can relax and enjoy my break.” Kohli’s 60 off 74 deliveries and a 113-run partnership with Rohit Sharma formed the backbone of India’s run chase. It gave the tourists back-to-back series wins against Australia and New Zealand and ensured they will be a force to be reckoned with in the World Cup later this year. 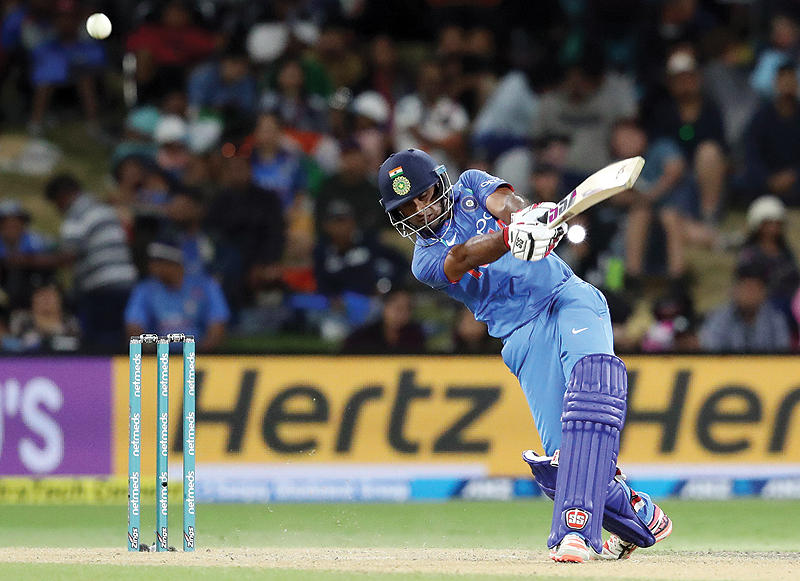 Sharma top-scored with 62 while Ambati Rayudu was unbeaten on 40 and Dinesh Karthik on 38. While Rayudu was steering India home, the International Cricket Council announced he had been suspended from international bowling. The part-time spinner was cited for a suspect action after the first ODI against Australia two weeks ago. He has not bowled since on tour as India’s recognised bowlers proved too much for Australia and New Zealand. “They are teaching us a lesson and we’re required to rise to the challenge,” New Zealand captain Kane Williamson said. Ross Taylor (93) and Tom Latham (51) gave the innings credibility but proved no challenge for the visitors. Sharma’s first wicket partnership of 39 ended when Shikhar Dhawan edged Trent Boult to the lone slip Taylor to be gone for 28. Kohli then joined Sharma and the pair swatted the attack around the ground in their century stand for the second wicket. New Zealand, taking a leaf from the India playbook, brought two spinners into the match after the tourists’ spin twins Kuldeep Yadav and Yuzvendra Chahal took the bulk of the wickets in the first two matches. Ish Sodhi proved expensive but Mitchell Santner was tight and finished with one for 45 after he cleverly deceived Sharma in the air and the India opener was stumped. Kohli, who averages a century every 5.6 innings, was due a big knock in New Zealand after posting 45 and 43 earlier in the series, but his attempt to drive Boult to the cover boundary was well caught by a leaping Henry Nicholls. Boult proved the most economical of the New Zealand bowlers with two for 40. Only Taylor, and for a time Latham, offered any real resistance after another disastrous start by the top order. Both openers were gone and New Zealand were two for 26 when Taylor went to the middle and Latham arrived at three for 59 with the dismissal of Kane Williamson (28). King Taylor and Latham mounted a rescue mission with a 119-run stand for the fourth wicket. But after Latham was dismissed for 51 it ignited a collapse in which the last six wickets fell for only 52 runs.